We know about the influence of heredity and environment on the ontological(1) and psychological evolution of groups. To some degree, we can even predict the development of individuals. A person might have sampled the wares in a friend’s medicine cabinet and become immediately dependent because his or her DNA receptors, inherited from a parent, had flipped a switch in the brain. So where does karma fit in? Setting aside the issue that karma is not something that science acknowledges as real — not that science accepts the Christian notion of God either — it is part of the present topic. A definition, which, in our example, might impact an individual’s chances of becoming addicted, or, in a more spiritual context, might influence an individual’s chances of successfully arousing kundalini. In a recent Symposium, we discussed the attributes that facilitate Kundalini awakenings, one of which was the notion of the Field, or a kind of Quantum event that “bounces” the affected person out of his normal vibrational alignment into an alternate, random or intentional, alignment of matter and consciousness that ultimately produces a Kundalini awakening. The thesis of my presentation was that matter (sexual energy) and consciousness, in their own right, are not enough to guarantee a kundalini awakening; these elements must be accompanied by a Quantum event. This would explain why certain persons are unable to arouse kundalini no matter how hard they try. It would also explain why kundalini visits certain persons without their ever wishing for it. It might also explain why some people resist addiction in spite of harboring the characteristics of the 17%. There is a random, aleatory aspect to the energy continuum that influences karmic certainties — reasons why some individuals escape poverty and others escape addiction when all environmental and heredity markers point to becoming dependent. Can we then overthrow the effects of heredity and environment in order to create an entirely independent new Being? Kundalini provides a biological basis — a jumping off point for karmic realignment. However...as you move forward, take nothing for granted. Most people become preoccupied with visions and dreams and spend a great deal of time and energy trying to interpret what they see which just entangles their minds and destabilizes them. In 99% of the cases, if a person dreams of a natural event such as a tornado or tsunami, it doesn't mean that they are blessed with prescience and their dream is going to become reality somewhere in the world. They may think so, but it's a waste of time and that person will be ensnared in illusion. Every human being is a Microcosm of the Macrocosm. In other words, every human being is the center of the Universe and has a Solar System within themselves. Due to the fact that we have all have different past conditioning and we were brought up in different environments, every individual's imagination is different from everyone else's imagination. But the formula stays the same. If the energy of St. Michael is present in a room of four people, it is highly unlikely that everyone will see Him. Some will even see a Her. A person with a Christian background will see an Angel of Fire, a Hindu will see Shiva. Another person will see the Voodoo Deity Shango, or the blazing torch held in the Olympics. It doesn't really matter. We all experience this cultural bias. People get too caught up in their meditative or dream visions — the things they see in the Astral World when their Ego is turned off. Afterwards, they get spend time defending what they saw with their Ego. Most of the time we say the same thing, but our Egos fail to realize it so we end up fighting and defending our positions as if they are sacred because it's what we saw. In reality, we feel and experience the same thing, but we don't see it the same way. 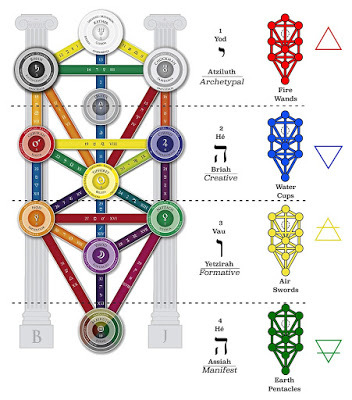 In terms of the Holy Qabalah there are Four Worlds. The First World is called Atziluth. This is the Archetypal World or World of Pure Spirit which activates all the other Worlds. In other words, all other Worlds evolve from it. Atziluth — because it is Pure Spirit beyond time, beyond space, and in essence beyond manifestation — is beyond description. Some Qabalists use the term Atziluth as the Divine World, or the World where the Thoughts of God exist. This is the world of the Primal Fire. The important inference from this World is that it is the "Thought" of God as this Archetype is something we can all agree on. It is beyond time and space — the first thing that filters through us when we relate to the world and look outwards. An apple is an apple, not an orange. Same as a cup is a cup, not a spoon. We can all agree on this. If we do not, we are labeled insane. How we see it though, depends on the other Worlds that it filters through. The Second World is Briah, also known as the Creative World. This is the World of pure Intellect and the World of Primal Water. Water is always seen in relation to its opposite, which is Fire. So the Primal Fire sends a thought impulse into Primal Water and a Thought is formed. This Thought is not a visual Thought because that takes place in the next World, but this is the seat of Intuition so it is an Intuitional Thought. This is still a Thought, but more of an impulse, something we can feel in the deepest parts of our Being. We feel this with the Unconditional Love in our hearts. Hence the more Unconditional Love a person carries in their heart, the higher they are elevated and the more Intuitive, more Empathic they are deemed to be. They are considered feelers, instead of a thinkers. This means their consciousness resides in this world of Briah and is the highest conception of God we can experience since the World above it, the World of Primal Fire is a Force, while Water is a Form and can be seen by human beings intuitionally with the Mind's eye. So in relation to dream symbolism we can agree on this as well as it’s the absorbing part of the Self that receives from the World above it and reads its real form. There is still no illusion at this point. We intuitively agree on things, but when we start to break it down intellectually with our Egos, we filter down into the lower Worlds and Light which shines from above starts to be tempered by illusion, or the reflection of the Truth, and now past conditioning comes into play and the thing we are seeing or intuitively feeling starts to get its visual form and we "see" it with our Mind's eye as a picture. The Third world is called Yetzirah and is the World of Formation, the Astral World, which is where the subtle and flashing patterns behind physical matter are found. This is Primal Air. In this World, because it's Air, the Ego starts to get involved as it does in all Air operations since Air is a lower manifestation of Spirit that moves and gives life to Water as well as Fire. They cannot exist without Air as the medium of expression. The whole operation is a cohesive whole which operates on the three elements of Air, Fire and Water working with each other. Air is the firmament which holds the other two elements in balance. Without Air there is no life. Air is where we feel and see the Astral World. The Astral World is created by Fire and Water, but we see it with the Mind's eye because of Air. Air is imagination. A human being without imagination is not a fully-functioning human being. He or she resides in a body bereft of motivation, drive, inspiration, and is basically living as an automaton, feeding its bodily needs and desires, but unable to participate in the beautiful thing we call human life. Sadly many people lack imagination and reside fully in their Egos and past conditioning. 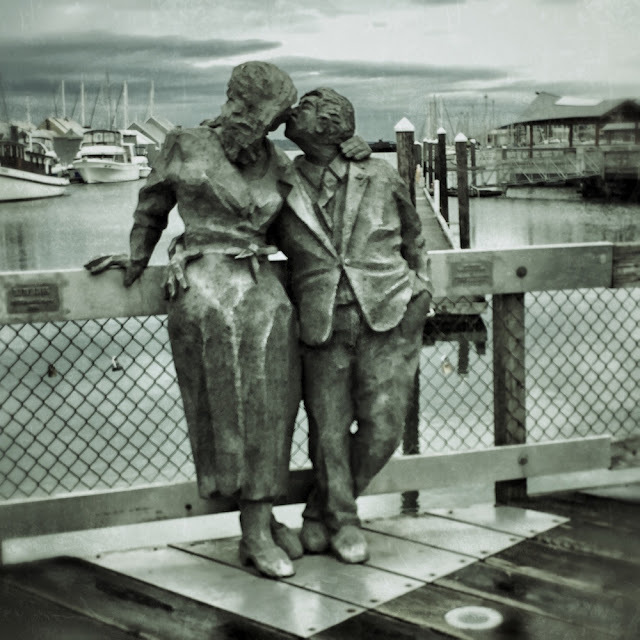 They resonate with the Past, unable to live in the Now or plan for the Future because to do so you need imagination. In terms of dream symbolism, it is at this point we start to see differences in our visions, but in spite of the fact that they may be one and the same archetype or subject. But because of our Egos, we get into defensive mode since what we experienced was real to us and we fail to see we are talking about the same thing. This is the essence of the St. Michael parable cited above. The Fourth and final World is Assiah, which is the active world, or the physical world of sensation, both seen and unseen energies of matter. This is the physical world which we all take part in and experience with the five senses of touch, taste, smell, sound and sight. The three other Worlds above are all experienced with the sixth sense through the Mind's eye. We won't talk much about this World because we've lived in it since birth and, because of the way the five senses function, we can agree with it. It's because of the experience of the five senses since birth that the Ego evolved and attached itself to the consciousness of the physical body. The rising in consciousness is the lifting of the Veil of Illusion and the rising of the True Self beyond the fake Self or the Ego. This is Spiritual Evolution: the purification of Karma and eradication of the Ego. Karma accumulates as a result of the growth of the Ego. To be born again in the Spirit one must shed the the Ego. Visions are most often a product of the imagination which is a product of an energy being present in the system, the Aura. Dreams are the same thing. As the energy manifests itself in the Aura, it needs to filter through the Four Worlds in order to leave the Aura, otherwise it remains lodged there. Human consciousness has to enter into an Alpha state in order to achieve this. This can be done through meditation or, more commonly, during dream states. Someone who does ritual Magick or energy invocations can bring in the desired energy into their Aura and this energy would affect their consciousness throughout the day until the person meditates, which is when these visions take place and the energy takes form. When they go to sleep, their dreams are influenced by this energy. 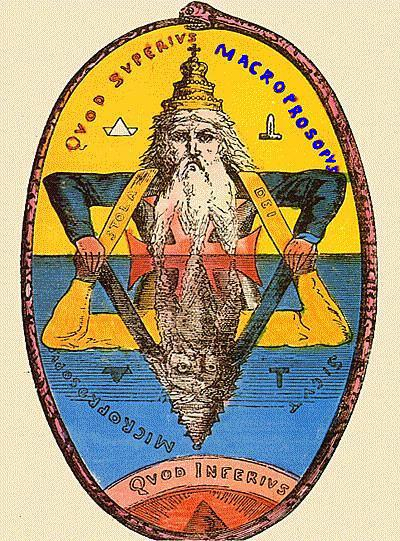 "As Above, So Below" is a Hermetic axiom that explains the correspondence between the different planes of existence, or Worlds. As one thing is happening in one "plane" it affects the manifestation in other "planes." Plane and World are the same thing in this instance. Everything which is pure energy has to filter through the Four Worlds in order to take effect. Energy is invoked in the World of Briah by using the power of the World of Atziluth. But in order to manifest itself, it has to go through the World of Formation or Yetzirah where it can be experienced as a vision, dream, or inspired thought. I say inspired Thought because this is not a Thought which is created by the Ego, but a Thought which is created by an energy outside the Self — a direct Thought from the True or Higher Self which resides in the Primal Fire or Atziluth. Someone who is in touch with the World of Atziluth and Briah on a continual basis throughout the day will have very a strong intuition and may receive prophetic ideas or premonitions because they see what is going to happen before it filters down through the other 2 Worlds and actually happens. But to be completely attuned to these worlds one has to be highly evolved. Everything has to filter through the Four Worlds to come to apparition. However, those adepts are rare because to be attuned to the first Two worlds in modern day society, you have to completely lose sight of the Ego and its impulses, unless you are in a constant state of meditation which is nearly impossible. People with an awakened Kundalini that is permanently functioning 100% in the brain will be in touch with Primal Fire and Primal Water and will be affected very little by their Ego and workings of the lower two Worlds. A permanent Kundalini awakening produces a complete numbing down of the physical body so that the consciousness is not aware of it, but is lost in itself, allowing the individual to see themselves from a third-person perspective where they literally see themselves outside of their own body. This permanent out-of-body experience of life is one of the gradual steps of the Kundalini awakening. It may take many years to attune to it, but it is one of the ways in which humans evolve. To completely leave the body and become one with Cosmic Consciousness is Spiritual Evolution. It is the liberation of consciousness from the body to become absorbed into the Universal Whole. In reality, we are all just sparks of consciousness localized in a physical body for the duration of time that the body is alive on planet Earth. Let those with ears of understanding comprehend this concept. It is the full breaking down of the Ego and is truly the cornerstone of all religion. 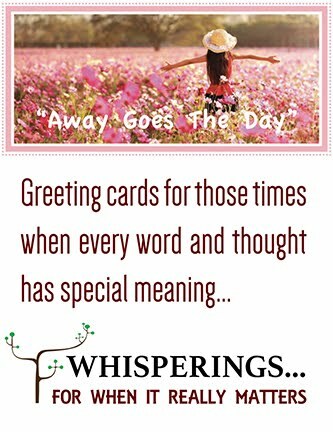 But remember always that lips of wisdom are open only to the ears of understanding. For most people these words you are reading will not make it past the second world of Yetzirah because Wisdom and Understanding take Place in the first two Worlds. And for Wisdom to exist there has to be Understanding, and vice versa. People get caught up trying to interpret their visions. If they see something outside of the realm of their Ego or something they unconsciously thought up, they believe it has to be some prophetic vision or premonition. But in most cases it is just something that filtered through the Astral, an energy that came into the Aura in order to be seen and in most cases is not important. If one misses a vision or can't interpret it, does it matter? No, in no way does it matter. If it filtered through a person's imagination, it did what it was supposed to do, which was enter into their aura and send them a message. The message was already received in the Worlds higher than the one where they are trying to interpret the message — the Astral World. Spiritual Rebirth is a process of forgetting, of eradicating memories. Remove the memory of the Ego and to have the person exist in the Now. The Now is a place of No Thought. Hence, complicating your lives by trying to interpret visions actually working against you. Stay in No Thought, and ride the wave of Pure Consciousness. This is the message of the Masters. Many experiments have been made with animals around the notion of consciousness, especially thanks to MRIs done in England with dogs. These showed brain activity in animals and showed that animals do have emotions, thoughts, and sensations. The law has now recognized that a domestic animal is no longer considered a piece of furniture, but is a sensitive being capable of perceiving and feeling pain. All the same, our society does not yet recognize animals as conscious beings. They were not going to judge or analyze the situation, but were well aware of what was happening. So even though they were very frightened by the experiment and the scientists present, they did not judge them. They only submitted to them! As a result of this experiment we see no only that these monkeys possessed awareness, but they also were able to feel empathy and compassion. Interestingly, these qualities of consciousness-empathy and compassion were not evident when humans underwent the same experiment. 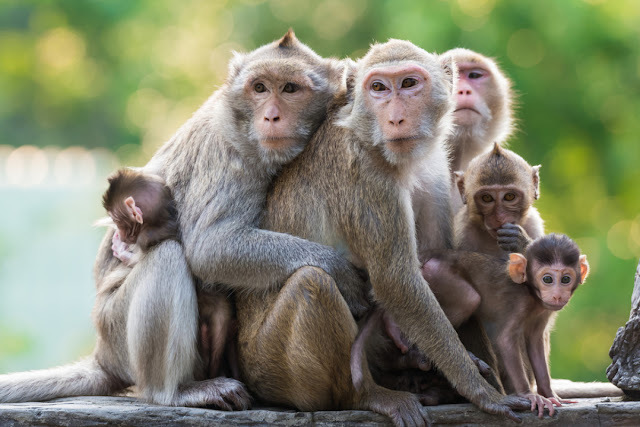 Unlike the monkeys, humans tended to increase the electric charge on the person undergoing the experiment rather than decrease it! One day, when mankind reaches an advanced state of evolution, we will no longer question the consciousness of other beings and we will certainly not make them undergo experiments to prove their awareness since it will be evident that they are sentient beings. In order to evolve to this state, we need to refashion ourselves by practicing mindfulness, compassion, and energy cultivation techniques in order to transform our reality and our perceptions of other conscious life forms. A person need only read the international news to understand the level of fear, doubt, and uncertainty in the world today. Despite all of this, there is also incredible hope arising from all corners of the globe. Millions of people are awakening to ancient spiritual truths and customs that show us that a different way of living is possible — one filled with compassion and reverence for all life and the Earth. Kundalini is the biological cause of this global shift, and it is happening now at a faster pace than ever before. 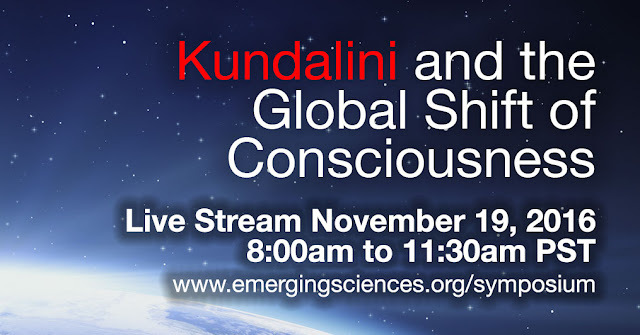 In our first Kundalini Symposium event, Kundalini and the Global Shift of Consciousness, we will explore the dramatic changes that are occurring all around us, and how we can all help facilitate real, long-term, and impactful change at a personal and global level. This is the start of something BIG. A symposium to address the various aspects of kundalini. 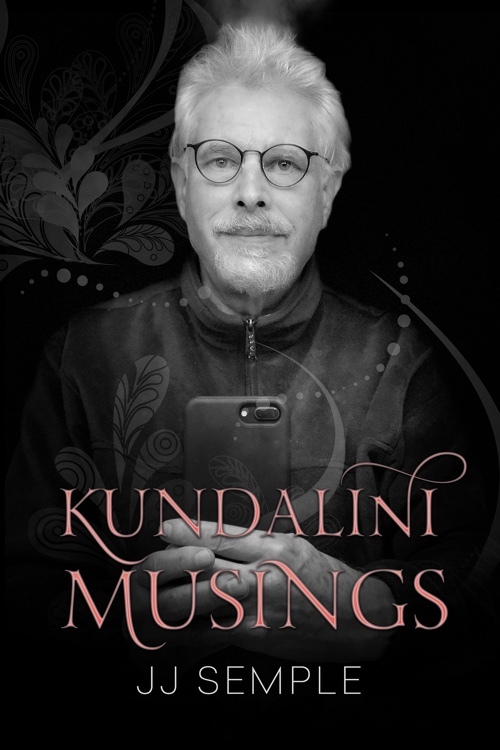 Hosted by The Emerging Sciences Foundation, it features a number of speakers with experience in raising, living with, and exploring the vicissitudes and effects of kundalini. Michael Bradford has been involved in research on Kundalini for more than 35 years. In 1977 he traveled to India where he spent six years serving as a volunteer worker for the Central Institute for Kundalini Research, founded and directed by the late Pandit Gopi Krishna. Michael has been a board member of the Institute for Consciousness Research (I.C.R.) since it was founded, and has been Director of Publications during this time. In 1985 he began working full time as an IT consultant in the data processing field, and retired in March 2014. He began studying Vedic astrology with Hart DeFouw in 1995, and in 2003 founded his own Vedic astrology practice. JJ Semple is the author of four best-selling non-fiction books dealing with energy cultivation techniques, kundalini, meditation, consciousness, alchemy, sexual sublimation, enlightenment, and mindfulness and their effect on human evolution. He is the founder of Life Force Books, a publishing company featuring books on energy cultivation, the neuroplasticity aspects of Kundalini, and helpful guidelines for living with Kundalini. 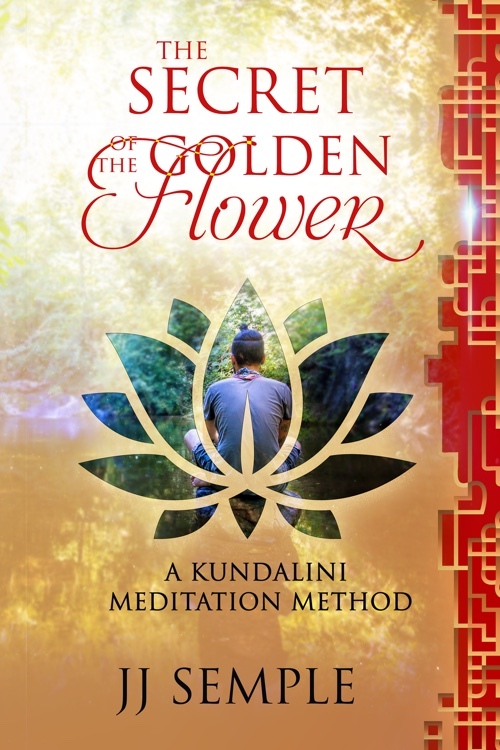 His Golden Flower Meditation method (GFM) is practiced by neophytes and adepts all over the world. In addition, he teaches sexual sublimation techniques for facilitating the kundalini process. Corinne’s journey with mystical experiences begun as a young child which led her on a rich academic path of inquiry into various subjects such as theoretical physics, anthropology, psychology and various mystical traditions. She has a M.S. in Psychology her studies focus on how spiritual awakenings impact positive social evolution. She is also KRI Certified Kundalini Yoga teacher, a Shambala Multi-Dimensional Healer, a graduate of the Berkeley Psychic School, and is a dancer, musician, artist and writer. Corinne has created a career in empowering start-ups and purpose driven organizations to be successful. Her career has led her to work with brilliant minds from places such as Los Alamos National Laboratory, NASA and the Alliance for Innovation in Science and Technology Information. Her company Pitch Deck Ninjas serves the business sector. She is also the founder of Wild Divine Bliss, an educational forum for kundalini awakenings. Carl Johan Calleman is a scientist and philosopher who has devoted his past thirty years to understanding the evolution of consciousness and life based on the Mayan calendar. Born in Stockholm, Sweden he gained a Ph.D. in Physical Biology and spent twenty years doing laboratory research into toxicology and Cancer Research. In this capacity he was a Senior Researcher at the University of Washington in Seattle and has served as an expect for the World Health Organization in addition to giving lectures at places like MIT, Institut Pasteur, Chinese Academy of Preventive Medicine and the National Cancer Institute in Tokyo. In 1994 he left his carrier in the hard sciences behind and started to lecture about one of the greatest mysteries of our time: The Mayan Calendar and has for instance written six books on this topic with the aim of making this accessible to modern people. The most recent books are The Global Mind and the Rise of Civilization (June 2016) and The Nine Waves of Creation – Quantum Physics, Holographic Evolution and the Destiny of Humanity (December 2016). His focus has been on explaining both biological and mental evolution up until the current time and beyond. He has also worked with Mayan elders such as Hunbatz Men and Don Alejandro Oxlaj and helped them to get their message out. For his own spiritual evolution Carl Calleman has been part of the Oneness University in India, which looks upon Kundalini energy as a crucial element in this. Award-winning author Teri Degler has ten books to her credit including The Fiery Muse: Creativity and the Spiritual Quest (Random House, Canada). Teri has spent many years writing on yoga philosophy, Tantra, kundalini-shakti, and the lives of highly creative women mystics. A deep interest in kundalini has lead her to do extensive research on the divine feminine known as Shakti in Hinduism and the parallels found in Sophia in Christianity and Shekinah in Jewish mysticism. Teri’s books have been translated into French, German, and Italian, and her freelance writing has appeared in many publications in the U.S. and Canada. She teaches workshops on writing and creative expression and has made many media appearances. Her most recent book, The Divine Feminine Fire: Creativity and Your Yearning to Express Your Self, was an Amazon.ca # 1 Bestseller in two spiritual categories. With a Bachelors of Science degree in business from California State University, Long Beach, Michael Molina has over 15 years experience in technology and marketing, and has led multiple “big data” projects. The founder of the Emerging Sciences Foundation and the creator of Brilliano, a social networking platform and collaboration tool, Michael believes in empowering people with the knowledge and tools necessary to improve the world we live in. He has served as an ESF board member since 2009. He is married with two young sons.